Please note that this is not a comprehensive list. Events based on “Last Will and Embezzlement” are happening all the time, all over the country, but the organizers don’t always inform us. We are deeply grateful to all those who use our film to serve and protect the elderly. whose elderly parents lost their life savings to an embezzler. 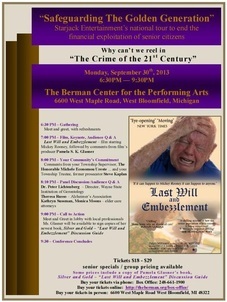 “Last Will and Embezzlement” is on the move again! Next up, The Irving Convention Center in the Dallas-Fort Worth area. Producer Pamela Glasner, the Keynote Speaker, will be joined, once again, by San Diego’s famed Deputy District Attorney Paul Greenwood, one of the country’s most ardent and outspoken advocate for the elderly. He directs one of the most aggressive elder abuse units in the United States, and Ms. Glasner had the pleasure of sharing the stage with him at Holy Cross College a couple of years ago. The conference, which takes place on 24 June 2014, is hosted and sponsored by Wells Fargo Advisors, who are generously treating Ms. Glasner to two nights at the lovely Dallas Marriott Las Colinas. The Bucks County Crimes Against Older Adults Task Force sponsors this annual symposium to bring together law enforcement officers, health care and social service professionals to provide education, heighten awareness and facilitate communication. The symposium is an all-day event which will include a complimentary breakfast, a screening of Last Will and Embezzlement - A Documentary Film, followed by comments by one of its producers, Pamela Glasner. 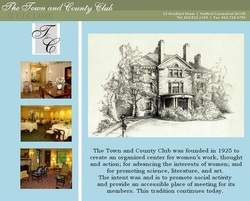 … all featuring some of the finest minds and most notable and dedicated professionals in the field of elder care and protection. 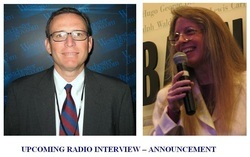 Producer Pamela S. K. Glasner joins AAG Gary Brown on his radio talk show, “The Attorney General’s Report w/Gary Brown”, on WVOX-AM, on January 14, 2014 at 2:05PM New York City time (the news usually runs a bit late). They will be discussing financial exploitation of the elderly and what senior citizens and their loved ones can do to prevent these crimes, as well as the initiatives put in place in Westchester County, and, of course, Starjack Entertainment’s film, “Last Will and Embezzlement”. Everyone is invited to call in and chat or ask questions by dialing 914-636-0110. Following the screening, the 2nd part of the keynote will a panel discussion from experts in the field, including Dennis Houser (CPA, Forensic Accountant), Chuck Danfield (Area Agency on Aging), Richard L. Newman, Esq. (Elder Law Attorney), David Bonacquisti, John Monaghan, and Marc Furber.